Rapid mass sinking of cells following diatom blooms, observed in lakes and the sea, is argued here to represent the transition from a growing to a resting stage in the life histories of these algae. Mass sinking is of survival value in those bloom diatoms that retain viability over long periods in cold, dark water but not in warm, nutrient-depleted surface water. Mechanisms for accelerating sinking speed of populations entering a resting or “seeding” mode are proposed. Previously unexplained features of diatom form and behaviour take on a new meaning in this context of diatom seeding strategies. Diatoms have physiological control over buoyancy as declining growth is accompanied by increasing sinking rates, where the frustule acts as ballast. Increased mucous secretion in conjunction with the cell protuberances characteristic of bloom diatoms leads to entanglement and aggregate formation during sinking; the “sticky” aggregates scavenge mineral and other particles during descent which further accelerates the sinking rate. Such diatom flocs will have sinking rates of ∼ 100 m d-1 or more. This is corroborated by recent observations of mass phytoplankton sedimentation to the deep sea. This mechanism would explain the origin of marine snow flocs containing diatoms in high productivity areas and also the well-known presence of a viable deep sea flora. That mortality is high in such a seeding strategy is not surprising. A number of species-specific variables pertaining to size, morphology, physiology, spore formation and frustule dissolution rate will determine the sinking behaviour and thus control positioning of resting stages in the water column or on the bottom. It is argued that sinking behaviour patterns will be environmentally selected and that some baffling aspects of diatom form and distribution can be explained in this light. Rapid diatom sedimentation is currently believed to be mediated by zooplankton faecal pellets, particularly those of copepods. This view is not supported by recently published observations. I speculate that copepod grazing actually retards rather than accelerates vertical flux, because faecal pellets tend to be recycled within the surface layer by the common herbivorous copepods. Egestion of undigested food by copepods during blooms acts as a storage mechanism, as ungrazed cells are likely to initiate mass precipitation and depletion of the surface layer in essential elements. Unique features of diatoms are discussed in the light of their possible evolution from resting spores of other algae. 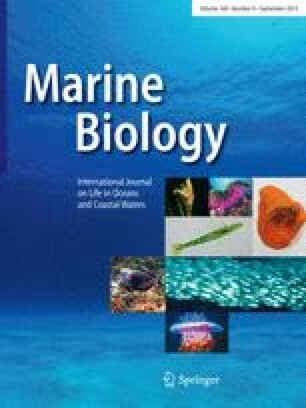 An evolutionary ecology of pelagic bloom diatoms is deduced from behavioural and morphological characteristics of meroplanktonic and tychopelagic forms. Other shell-bearing protistan plankters share common features with diatoms. Similar life-history patterns are likely to be present in species from all these groups. The geological significance of mass diatom sinking in rapidly affecting transfer of biogenic and mineral particles to the sea floor is pointed out.